The Curious (and Shameful) Case of "@OpPeta"
David Martosko taught us how dangerous the online world is for animal rights activists, when he posed as both a veterinarian and an animal rights activist in online groups to gather intelligence on actual animal rights activists, and to incite activists to commit criminal acts against an animal enterprise. Martosko's recent deposition in conjunction with some of the work he performed for the Center for Consumer Freedom, shows us how unscrupulous special interest groups can be, and how vulnerable animal rights activists are to corporate attacks, even when they work for some of the largest, most public animal protection organizations in the world. A small online group claiming to be a faction of "Anonymous" has taken up the "PETA Kills Animals" cause under the title "@OpPeta." 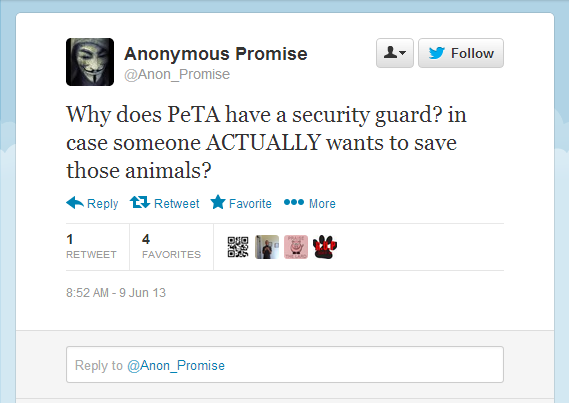 By all appearances, this unconfirmed faction of "Anonymous" seems to be attacking PETA at the behest of No Kill Nation's president, Debra M. Day, at least to some extent. To another extent, it appears to be an attempt to legitimize its anti-PETA predecessor, @OpExposePeta, by taking on characteristics of popular"Anonymous" campaigns that have been about first amendment protections, and preserving privacy. One thing's for certain, this action being taken under the "Anonymous" brand name isn't about sovereignty and freedom from tyranny. It's personal. And it appears to be about settling "No-Kill" scores. Before there was @OpPeta, there was @OpExposePeta, a Twitter-based group dedicated to posting and re-posting all-things Nathan Winograd and "PETA Kills Animals," and providing a welcoming gathering place for the "we hate PETA" Twitter community. From its apparent inception on April 3, 2013, followers of @OpExposePeta have been treated to a steady barrage of the Center for Consumer Freedom's "PETA Kills Animals" propaganda, beginning with this iconic anti-PETA image, paying tribute to, if not published by, the Center for Consumer Freedom. Other than the random sharing of "No-Kill" "good news," Debi Day stayed out of the @OpExposePeta fray until PETA petitioned HuffingtonPost.com for any and all identifying information with regards to three anonymous online commenters who went above and beyond the "PETA Kills Animals" call of duty. These three HuffingtonPost.com commenters made allegations of their own against PETA, while hiding behind pseudonyms. One of them being Debi Day's personal friend. Midst the usual regurgitations of Nathan Winograd's and the Center for Consumer Freedom's respective "PETA Kills Animals" "news," Debi Day shares a bit of "No-Kill" "good news" with her pro-"No-Kill"/anti-PETA ilk. Otherwise, Day is noticeably absent from the @OpExposePeta conversation. That is until her friend is named in the HuffingtonPost.com petition, and @OpPeta was born. Upon learning of the HuffingtonPost.com petition, the tone of Day's posts take a decided turn towards "personal," yet she hadn't yet revealed why they were personal, at least not publicly. Debi Day kept other aspects of her history hidden as well, neglecting to disclose to group-members that like PETA's legal action protecting their interests, she too has taken legal action against negative online comments made about her and her organization, "No Kill Nation." Ms. Day didn't disclose to this gathering group that she had successfully sued and won a case not unlike the legal action PETA initiated with the HuffingtonPost.com petition. @OpPeta made their first appearance on @OpExposePeta on May 27th, announcing their arrival with an iconic Center for Consumer Freedom graphic, and a "pastebin" featuring a quote attributed to Ingrid Newkirk, a quote that Newkirk isn't responsible for. The quote actually has its origins in an environmental publication, not an animal rights publication. So @OpPeta was already off on the wrong foot from its very first step, though they didn't know at the time just how off-base they were in their struggle to find something legitimate to hang on to. Unlike @OpExposePeta, which had been clear in its purpose to malign PETA with any and all available Nathan Winograd and Center for Consumer Freedom-generated hate, @OpPeta flailed along without a specific purpose, vacillating between aligning themselves with @OpExposePeta and the Center for Consumer Freedom, and trying to etch out a name as defenders of the first amendment. Until Debi Day revealed that one of the HuffingtonPost.com commenters was a friend, and that she could use any help that @OpPeta might be able to offer her, that is. On May 29, 2013, Debi Day publicly discloses that one of the HuffingtonPost.com commenters is her personal friend, but says nothing about her own legal battle with an online commenter. @OpPeta now has a flesh-and-blood HuffingtonPost.com poster-child, but still no concept of how far from being about "the first amendment" their mission is. Later that day, seemingly grateful for a solid new direction for their anti-PETA initiative, @OpPeta gladly offers their support to Day and her HuffingtonPost.com friend. Debi Day shares words of encouragement with the still-flailing @OpPeta brand, linking to another online anti-PETA group "PETA Shaming." Debi Day becomes a frequent and persistent participant in all-things @OpPeta, still not revealing her history of taking legal action against online commenters. 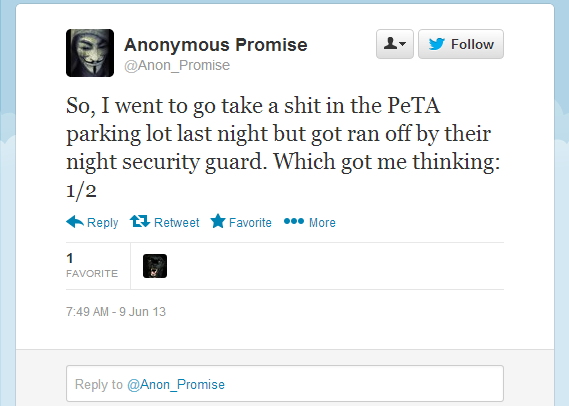 On June 7, 2013, a confirmed @OpPeta participant Tweeted "Walking into PETA," with this picture attached. A few days later, @OpPeta "activists" released the home addresses and other personal information of three animal rights attorneys who work for PETA, still unaware that their benefactor had sued and won a judgement in a near-identical lawsuit. In fact, Debi Day never disclosed her participation in a similar lawsuit to @OpPeta. A PETA supporter apprised @OpPeta of that fact during a Twitter discussion about this dubious campaign. Smile and say "ill-conceived notion." PETA is staffed by animal rights activists, and these activists are individuals who work very hard to save animals all over the world from abject suffering. It is painful and thankless work. So when the "Jane/John Does" of this world accuse PETA of egregious animal abuse and neglect, they're accusing the individuals who work and volunteer for PETA of those crimes, and it is the opinion of this writer that PETA MUST pursue this issue on THOSE individuals' behalf. No longer able to operate under the facade of "protecting the first amendment," the small Twitter group has settled back into a rhythm of posting comments on behalf of Nathan Winograd and Center for Consumer Freedom, sprinkling the occasional threat of further action in for good measure. "December 2, 2012: BREAKING NEWS: No Kill Nation Inc. & President, Debi Day, WIN Defamation Lawsuits! "In 2011, an individual by the name of Randy DeCarlo set out on a mission to destroy No Kill Nation’s reputation and my own, not only in the animal advocacy community, but also in our local community here in South Florida. From behind his computer screen, he made numerous false statements about No Kill Nation, our board members, employees and me, on Facebook and Internet blogs. The majority of these statements accused us of being scam artists and frauds who stole money from donors. Nothing could be further from the truth. If I get one point across through this letter, I hope it is this: neither No Kill Nation nor I have ever misappropriated donations. "As Mr. DeCarlo’s allegations grew both in volume and severity, I made the difficult decision to hire legal counsel to protect our rights and reputation. All legal bills were paid for by me, personally, and did not come out of donations. At the outset of the lawsuit, our legal counsel offered Mr. DeCarlo a settlement that entailed retracting his false statements, to which he scoffed and boasted about seeing us in court. As the lawsuit progressed, the judge ordered Mr. DeCarlo to produce evidence in support of his statements. Mr. DeCarlo never provided any documents to support his false and defamatory statements. "When our lawyers offered to show Mr. DeCarlo the accounting records of the “Everglades 100+” project (the project that was the subject of most of Mr. DeCarlo’s accusations), he failed to respond to or even acknowledge the offer. "No Kill Nation’s records show that it properly accounted for all donations made to the “Everglades 100+” project. In fact, No Kill Nation merely served as administrative support for the many local rescue volunteers involved in the “Everglades 100+” project. More specifically, No Kill Nation agreed to accept donations from the public to the “Everglades 100+” project for the purpose of monitoring the project’s finances. No Kill Nation put all of these donations into a restricted account, and used the donations to pay only for expenses that arose from the project, most of which came in the form of bills from veterinary offices. "When everything was said and done, the expenses from the “Everglades 100+” project exceeded the donations received. No Kill Nation stepped up to the plate and paid for the difference using monies from its unrestricted account, which is funded in large part by my personal donations. I hope you will take a few minutes of your time to click on the links below, one of which provides this accounting summary, as well as No Kill Nation’s IRS Form 990’s (tax returns) for the years 2010 and 2011. "Recent orders from the court found Mr. DeCarlo to be liable for defamation and tortious interference with No Kill Nation’s business relationships. The judge also recently entered a permanent injunction against Mr. DeCarlo, which requires him to remove all statements he made about No Kill Nation, our board members, employees and me that refer to us as being frauds and scam artists, and to refrain from making similar statements in the future. A jury trial on damages is scheduled for early 2013. I invite you to click on the links below to see copies of the complaint, the default judgment, and the permanent injunction, in addition to the financial records I spoke of earlier. "Finally, many of you may be curious why we didn't come right out and display our accounting records online for the world to see when Mr. DeCarlo first began to make false accusations about us. Although I desperately wanted to clear the air, I thought it was important to display strength and character—the type of strength and character that does not bend to the will of tormentors. Just because someone on the internet accuses you of wrongdoing, doesn't mean you need to stop everything you are doing and appease them. It is a cornerstone of our society that we do not accuse people of wrongdoing without any supporting facts, and then demand they prove their innocence. It's not about "corporate bullying." @OpPeta is targeting PETA on behalf of a woman and a "corporation" that also sought legal protection against online defamation. And clearly it's not about saving animals. Both PETA and No Kill Nation are 501(c)(3) non-profit corporations, or charities. 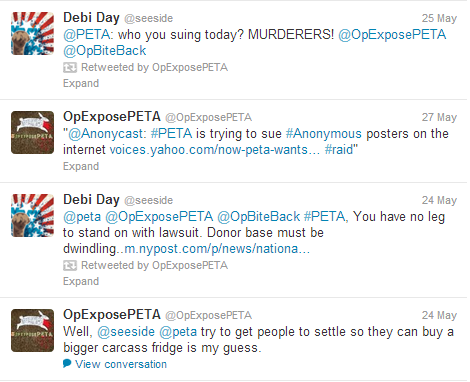 @OpPeta isn't raging against a "corporation," they're siding with corporations against animals. And Debi Day's Not Too Happy About the Exposure.